(CNS): Next weekend a band of Cayman Pirates will invade the south-eastern peninsula of the United States with the aim of pillaging and plundering and running off with the prize of Champions of the Fort Lauderdale Ruggerfest Touch Tournament 2014. A merry band of 12 marauders will embark on their third annual trip to this tournament aiming to improve on their semi-final position in 2012 and hopefully to capture the trophy for the first time. Sponsored by Trident Trust and promoted by the Cayman Touch Association the Cayman Pirates go to the event in fine fettle. Coached by Aussie legend (at least that’s what his girlfriend calls him) Shaun Hardcastle, the Pirates are led onto the field by the wonderfully-named Captain Morgan – Morgan Shelver that is. He may lack the flowing locks and cocked-feather-in-hat of the infamous buccaneer but his play is as intoxicating as the eponymous rum and certainly makes his opponents heads spin. Every year in Cayman the standard of Touch (similar to rugby league but without the tackles) increases as more and more people are drawn to the sport. It is a high energy game with limited player-to-player contact and is just right for guys and girls looking to get involved in a fast-paced ball game. 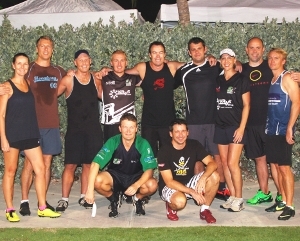 The Cayman Pirates will be challenging teams from New York, Washington DC, the East Coast and Florida but most of all they will be looking to develop their teamwork and playing style ahead of other tournaments in the US later this year such as the National Touch Championships and the Touch World Cup in Australia 2015. The team has been training for several weeks and is looking to build on work done earlier in the year combining a game of innovative attacking moves with a balanced defence. It is a work-in-progress but looking at the roster there is a heady mix of blistering pace, astute play-making and sage-wisdom. A full report of the Pirates’ progress will be made next week. Cayman Pirates 2014 Squad – Morgan Shelver ©, Neal Ainscow, Marc Randall, Nic Swartz, Richie Gordon, Brad Stephenson, RileyMullen, Brandon Smith, Guy Major, Chandra Friesen, Jax McCarty, Evelyn Ritch.